• Case offers a wide range of possibilities for system component selection. • Truly versatile thanks to repositionable and removable HDD slots. • Removable ODD cage for maximum flexibility of water cooling and drives. • Three repositionable HDD slots allow installation of even the biggest graphics cards. • Adjustable top cover vent can be closed for absolute silence, partially opened for more air exhaust or fully open, with the added possibility of mounting a water cooling radiator. - Unique airflow-optimized fan blade design reduces noise-generating fan turbulence. • Design permits the installation of up to four additional cooling fans. • Integrated 3-step fan controller for up to three fans. • Airflow follows a clear path, to quietly and efficiently lower the system temperature. All exhaust air is directed to the rear, to further minimize any noise experienced. • Optimized for liquid cooling, with specially designed areas to add radiators up to 360mm on front, top and rear. • Sound insulating material on top, side and front that dampens vibration and further guarantees silent operation. • Stylish design with high-quality materials - the hallmark of be quiet! Cases. • Motherboard tray features large cutouts for the CPU cooler backplate, supporting all present and future socket designs. • Professional cable management is adaptable with extensive cable routing options. • Compatibility with all be quiet! products and all available graphics cards. • Air-cooled and water-cooled systems. • Any PC that requires superior levels of quietness, such as audio editing, studio work — or simply a gaming and multimedia system for your living room. Features • Highly Versatile construction with repositionable HDD slots and a removable ODD cage. • Optimized for Liquid Cooling with three specially designed areas of up to 360mm to add water cooling radiators. • Adjustable Top Cover Vent that can be closed for absolute silence, partially open for more air exhaust or fully open, with the added possibility to mount a radiator. • Whisper-quiet Operation thanks to two pre-installed Pure Wings 2 fans featuring nine airflow-optimized fan blades that reduce turbulence while increasing the air pressure. • Completely Sound Insulated with integrated dampening material on top, side and front. be quiet! 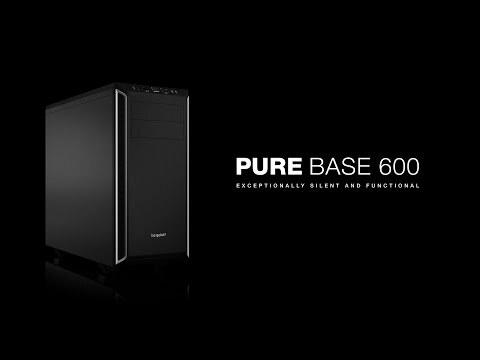 Pure Base 600 Silver Mid Tower Computer Chassis, ATX/MicroATX/Mini-ITX, 2x PureWings Fans, 3-Speed Fan Control is rated 5.0 out of 5 by 2. Rated 5 out of 5 by Sabat from Great silent PC case. If you want to play your games in almost silent room than look no further. This entry level case from Be Quiet! is well design and with lots of room inside. Also fully modular. You can remove almost every single part ( drive cages, optical bays etc). Also you can do it without any tools. Build quality is great (German technology). Lots of sound dampening material around and support for up to 360 mm rads in front and top and 120 mm at rear. Also 2 Be Quiet! fans included and 3 step fan speed controller build in front panel of the case. I got i7700K with Corsair H105, MSI 1080Ti Gaming X with Corsair H75 and 32Gb RAM. My idle temps are around 35 on CPU and 28 on GPU with lowest fan speeds. So my point is that front intakes look small but they are doing good job apparently. Rated 5 out of 5 by skektek from A pleasure to build A good, roomy case with 5.25" drive bays. I got this to replace a Corsair Carbide 100R Silent Edition, and was pleased to find that it's noticeably more solid and significantly quieter. My only niggle so far is that the sense on the front panel headphone socket is so sensitive that every time the headphone cable is tugged slightly, Windows thinks the headphones have been unplugged and plugged back in. I can live with that though. Overall, a great quality case, which I would recommend.